From Jabsco, Lawrence hose, and Forespar comes marine-grade toilet and plumbing supplies specifically designed for various types of boats. Heads, pump assemblies and various waste removal systems help to keep your boat sanitary and reduce the amount of unpleasant odors. Your boats plumbing is an important system, and that is why you must only invest in top of the line products. 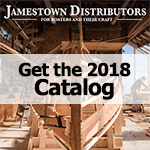 That is what Jamestown Distributors brings to you.